Assistance is appreciated. Thank you. It's been a while since I watched a Gamera movie that I may have forgotten or never learned when the Gamera movies came on television. For me, living in Topeka Ks. at the time, I remember first seeing A.I.P. Gamera films on T.V. back in the mid 70's. Can't remember the specific year, though. They had to be fairly speedy trips to US TV since A.I.P. essentially pre-bought the entire back half of the original run for television before they were even made (along with the mandate that white kids be included in the cast to make them more marketable to westerners). "A.I.P. essentially pre-bought the entire back half of the original run for television before they were even made (along with the mandate that white kids be included in the cast to make them more marketable to westerners)"
I didn't know that SIP had say in the films to this extent. I had always thought that Daiei included Caucasians to boost sales globally, not just at US insistence. Interesting. 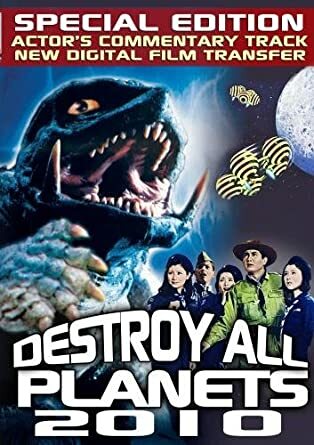 ^yup, in fact there's a dvd of Destroy All Planets spuriously titled "Destroy All Planets 2010" by retro media that has an audio commentary with Carl Craig (the caucasion kid from the film). He did say they came to TV within a few years, in fact he didn't even know it was on TV, but it was what kind of prompted me to ask the question in the first place. I first saw the Sandy Frank versions on VHS in 1989, and on TV in the years after that (including MST3K)...you could not imagine how ticked off I was that the AIP versions were no longer being aired. Thankfully they still exist (although not in great quality) on several low budget DVD sets, and S!F at least got the Audio tracks for some of them, too bad they could not procure high quality video. It was over a decade later so maybe this would be an easier question: how long did it take for Super Monster to get to the States? I know it aired on the USA Network and Elvira's movie hosting show in the '80s. ^That is a great question. The Elvira version was just the Japanese version with the English dub track placed on top, (unless the version that S!F released on DVD was different to the Elvira one actually shown on TV) what S!F would eventually use as their standard release, albeit they had btained a much better HD video print. There was another unlicensed DVD released by wanna-be horror host Mr. Lobo under the "Cinema Insomnia" label, but I cant remember if it was the actual Filmways version or just liike all the others. What I do remember was that the film was often interrupted (MST3K style but not in a good way) , and a good 15-20 minuets of the already short film were missing. I do remember the original Filmways version with English opening/closing credits was on Television at least 2-3 times in the early 90's on late night syndication where I lived. I had recorded it on VHS, and about 10 years ago attempted to convert it to digital format, but failed and foolishly/presumptuously I tossed my VHS thinking I would not need it anymore. It was not until a later viewing did I realize the audio/video got out of sync as the film went on. Despite its flaws forum member H-man wanted a copy, below is a link to the credits as he posted on them on Youtube. Thus its why its one of the last films on my want-list of film variants. I know I cant have been the only fan to record this version on VHS. It would be good to know when it first aired/last aired and how often and in what parts of the country, other than Sacramento which I can confirm. Sorry to necro-post but I'm bumping this thread with some info I've found lately at Newspapers.com. They don't have a complete database of all publications, of course, so there are still likely some holes. I can't verify that these are the very first television broadcasts of these movies. These are simply the earliest dates I've found. Likewise, Return of the Giant Monsters ("Gyaos") was first mentioned in a report in the Pittsburgh Post-Gazette on July 4, 1968. Win Fanning reports that WPXI 11 in Pittsburgh has picked up several movies, including ROTGM, for its Chiller Theater. The Pittsburgh Press reported on Aug. 27 that other films in the package included Frankenstein Conquers the World, The X from Outer Space and Yongary. The earliest broadcast I can find, however, was on Sep. 28 of that year at 10:40pm on KVII from Amarillo, TX. (Reported in Lubbock Avalanche-Journal on Sep. 22.) By the way, Pittsburgh would finally get to see ROTGM on Channel 11 on November 30, 1968 at 11:20pm, followed by TXfOS. The earliest date I can find for Destroy All Planets ("Viras") is November 28, 1970 (3pm on WDCA out of D.C., reported by The Baltimore Sun in the Nov. 22 edition), but I would not be surprised if this one had turned up somewhere in 1969. Gamera vs. Monster X ("Jiger"): Also on WPXI, February 27, 1971 at 11:15pm. (The Kane Republican, Kane, PA, 2/20/71.) Again, these dates are simply the earliest I've found. Still, I'd like to believe that some programmer at Channel 11 really liked Gamera movies. Super Monster: February 14 (how romantic), 1982 at 9am on Channel 8 in MS. I can't figure out what station this was but it was reported in McComb, Mississippi's Enterprise-Journal on Feb. 12. This film, either as "Super Monster" or "Gamera - Super Monster," was broadcast on MTV during its early years but I haven't found a TV listing for that just yet. For some reason, AIP apparently never picked up Zigra. I think the Sandy Frank version was dubbed in 1985 (the year that one of the dubbed characters refers to as the present date) but it didn't turn up until a 9pm broadcast on the USA Network on April 3, 1987. (The Palm Beach Post, same date. )The Celebrity video release —along with "Gamera," "Barugon," and "Gaos"— seems to have been July 14 of that year. (Variety 7/8/87 and Billboard 6/6/87) "Guiron" would hit home video in August 1988. I just want to give you a round of applause. 1. Never apologize. Your posts and research are amazing, and welcomed. Thank you Thank You. H-Man wrote: The earliest date I can find for Destroy All Planets ("Viras") is November 28, 1970 (3pm on WDCA out of D.C., reported by The Baltimore Sun in the Nov. 22 edition), but I would not be surprised if this one had turned up somewhere in 1969.
and Carl Craig (who played Jim Morgan) spoke to how the film aired on US television not long after he had filmed it. So much so that relatives called to tell him, since he had no idea it had been dubbed (not his original voice) , and was on Television. H-Man wrote: For some reason, AIP apparently never picked up Zigra. I think the Sandy Frank version was dubbed in 1985 (the year that one of the dubbed characters refers to as the present date) but it didn't turn up until a 9pm broadcast on the USA Network on April 3, 1987. (The Palm Beach Post, same date. )The Celebrity video release —along with "Gamera," "Barugon," and "Gaos"— seems to have been July 14 of that year. (Variety 7/8/87 and Billboard 6/6/87) "Guiron" would hit home video in August 1988. This is odd. AIP did dub *Smog Monster* (which came out in 1971, same as Zigra), but we know this was at the tail end of this way of doing things, Maybe they only had enough time/budget to dub one of these. Though I may be incorrect, AIP did continue to distribute films from other countries for a while, maybe their deal with Daiei specifically just didn't work out. The mid-80's date seems to be correct. Sandy Frank was doing some of his worst work at this time. Re dubbing Gatchaman into "G-Force". Additionally Time of the Apes, Legend of the Dinosaurs, Mighty Jack and Fugitive Alien compilations as well, all that got picked up by MST3K in 1988/89 for original KTMA airings. Also the fact that Guiron was the last of the Sandy Frank films to be distributed on VHS makes sense, why It's VHS box art differs so drastically from the design of all the others. H-Man wrote: Sorry to necro-post but I'm bumping this thread with some info I've found lately at Newspapers.com. They don't have a complete database of all publications, of course, so there are still likely some holes. I can't verify that these are the very first television broadcasts of these movies. These are simply the earliest dates I've found. Thanks for doing this, great work! Interestingly, WDCA-20 later became the D.C.-area UPN affiliate, and therefore ran Return Of The Giant Monsters when it appeared on UPN in April of '02, the last legit airing of the AIP version (I have no idea how "authorized" the CometTV airings of the AIP Gameras are). I don't recall catching any other Japanese monsters on there after I moved to the area in '88... it was always the "Star Trek Channel" to me, as they ran TOS reruns and first-run episodes of TNG and every subsequent Trek series. As mentioned, Zigra got a prime time premiere on USA on 4/3/87. The Sandy Frank versions of Barugon and Gaos also premiered on USA as the featured films on Commander USA's Groovie Movies (2 pm on Saturdays, not weekday prime time). Gaos was first, on May 2, 1987. Barugon was featured two weeks later on May 16. Considering the time between this report and the eventual video release (less than two months), I have to wonder if a colorized version had already been produced and shelved after the polling results got back to Celebrity's execs. On the other hand, if Sandy Frank or King Features or Celebrity had produced a colorized version, why sit on it? They could have released both colorized and black and white editions after all. We'll probably never know but it's intriguing to consider there might have once been a color version of Gamera. There are also three more versions of Gamera vs. Barugon that have been seen in this country. At some point in the late '60s or '70s, the AI-TV version was further condensed to about an hour long and re-titled "Revenge of the Fire Monster." A 16mm print sold on eBay in 2008. This version might have been printed on black and white film stock? I haven't been able to find any information about this through news archives. 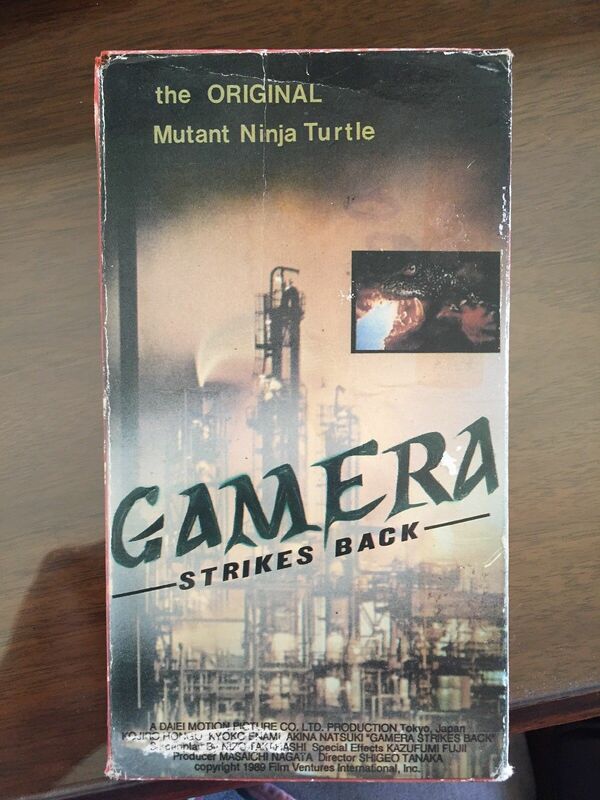 The other two versions seem to have been video and DVD only, both under the title "Gamera Strikes Back." The first iteration was the work of Film Ventures International and released on VHS by Majestic Home Video in 1989. This was apparently the Sandy Frank release of the export version with new titles and credits over footage of Ghidrah. EastWest's DVD version of "Strikes Back" was the AI-TV version ("War of the Monsters") and, ridiculously, the title card was a cropped scan of the Majestic Home Video sleeve! Majestic Home Video cover and EastWest version "title card". "Revenge of the Fire Monster" info. "Gamera Strikes Back" info. O.Supreme wrote: This is odd. AIP did dub *Smog Monster* (which came out in 1971, same as Zigra), but we know this was at the tail end of this way of doing things, Maybe they only had enough time/budget to dub one of these. Though I may be incorrect, AIP did continue to distribute films from other countries for a while, maybe their deal with Daiei specifically just didn't work out. It might have had something to do with Daiei's bankruptcy, but that's just speculation. For all we know they realized it wasn't any good. Joseph Goodman wrote: Interestingly, WDCA-20 later became the D.C.-area UPN affiliate, and therefore ran Return Of The Giant Monsters when it appeared on UPN in April of '02, the last legit airing of the AIP version (I have no idea how "authorized" the CometTV airings of the AIP Gameras are). I'm pretty certain the Comet broadcasts are on the assumption that those films are public domain. They look truly terrible, and Gammera is the version that popped up during the Alpha Video and Retromedia "wars" wherein the title screen digitally fades to the credits. In the original theatrical release, 16mm prints, and video versions up to circa 2003 (including the Neptune Media release), there's a scene with General O'Neill between the title and credits. In short, Comet's video source is probably a bargain basement DVD. The MGM version of Return of the Giant Monster that played on UPN was excellent. Yeah it's still cropped to 1.37 but it's mastered from good looking elements. The sound is terrific too. I bet the master is still in some MGM facility. And in case anyone here hasn't seen it yet, the Amazon Prime streaming version of Gammera is fantastic. (It's the same scan utilized by Rifftrax some time last year.) I don't have all the details but supposedly Legend Films purchased a 35mm print on eBay, scanned it, and released it. It's not perfect —reel three or four (I forget) has some bad problems and every shot of the Peter Fernandez-dubbed jet pilot at the beginning are spliced out— but it's by far the best looking version of the film out there. H-Man wrote: And in case anyone here hasn't seen it yet, the Amazon Prime streaming version of Gammera is fantastic... it's by far the best looking version of the film out there. Better than the Neptune VHS? Yes. The Neptune Media release is uncut of course, so it has that advantage, but the new transfer is in high definition whereas the NM transfer can only be seen on VHS. Like I said, the “Prime version” isn’t perfect but it’s generally the best the movie has looked probably since its initial release. The black levels in the Japanese footage are sometimes even more appealing than in the Kadokawa HD transfer as well. Considering Legend scanned a 35mm release print it looks really good. H-Man wrote: Sorry to necro-post but I'm bumping this thread with some info I've found lately at Newspapers.com. Out of curiosity, what are the latest broadcast dates for the AIP versions you've found? Surely they disappeared sometime before the Sandy Frank versions appeared. I have very faint memories of seeing what must've been War Of The Monsters on broadcast TV in Fort Washington, MD circa 1983-1984. I didn't record the final dates but I should have. (I'm going to record them the next time I do a free Newspapers.com trial.) I definitely looked at most of them though and I can tell you that they played into the mid to late '80s, I think with some even showing up into the '90s. It just depends on the location of course since most of the AIP versions had already started to "disappear" before the Sandy Frank versions in 1987. Not Gamera but Attack of the Mushroom People definitely played into the '90s. Godzilla vs. the Thing was still playing on Indiana's WTTV 4 well after the UPA television version, "Godzilla vs. Mothra," was being picked up by cable superstations. Legally I'm sure none of that stuff was supposed to be played after a certain point but I guess you're not going to stop some little UHF station if they've got a 16mm print and 90 minutes to fill. The most interesting one I found was the New World version of Tidal Wave airing in select nationwide markets in '07 or '08 on either Ion or MyNetworkTV. That's more in line with UPN playing MGM's transfer of Return of the Giant Monsters though, but it's odd to me to think that this basically forgotten Japanese disaster movie with Lorne Greene poorly spliced in for maybe all of ten minutes got two hours on mid-afternoon TV just over ten years ago. 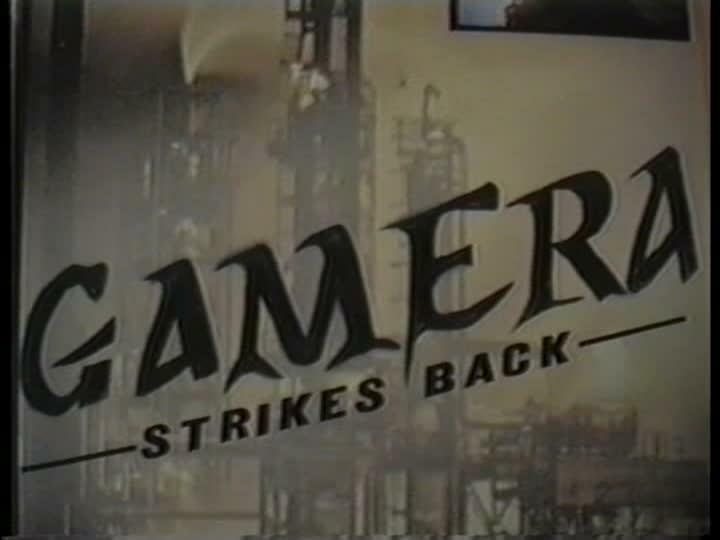 Yes I recorded off TV Gamera vs Monster X, as well as Dagora, and Gamera Super Monster from a local TV station (KMAX 31)in the early 90's *now our CW affiliate . These played concurrently with Sandy Frank Gamera films, I think though because there was no other dub for them. Additionally our legendary Horror host Bob Wilkins hosted a special evening showing Attack of the Mushroom People, but it was edited down to 1 hour with commercials, and they actually *fast forwarded* the film in broadcast to eliminate *boring parts*, it was more a novelty than anything else, still I wish I still had it. Losing this, and Super Monster were my most egregious errors in judgement.